Artist Dreadnoughts are powerful and rewarding. Great for strumming, flat-picking and lead work. This acoustic electric version is fitted with the fantastic LR Baggs Element pick up and StagePro EQ for optimal live performance. Artist Series feel right and are exciting to play; no matter if you are strumming hard or picking lightly, the guitar will do what you ask of it. For a more focused sound with fewer overtones, choose a mahogany top. For power, go for Sitka. 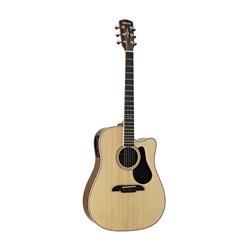 For warmth and response to a lighter touch, choose a Cedar top.